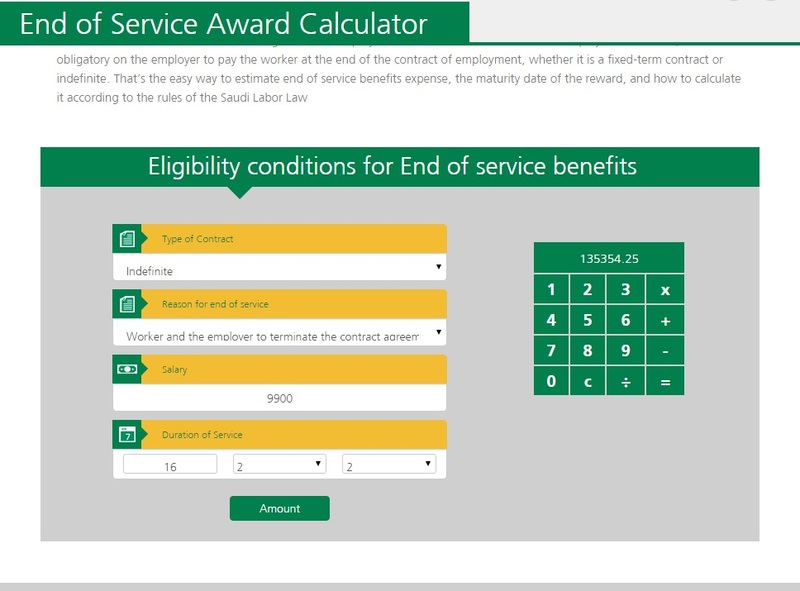 Muli ibabahagi namin ang pinakasimple at tamang computation ng ESB hango sa Saudi Labor Law. 1. Walang ESB para sa mga manggagawa (tulad nating mga OFW) kung wala pang dalawang taong pinagtrabaho sa kumpanya. – One half (1/2) month gross salary per year of service if nakatapos ng 2 years to 5 years. – One Third (1/3 month gross salary per year of service if nag-resign after 2 years to 5 years. – hindi kasama sa gross salary ang commission o anumang compensation na bahagi ng performance tulad ng bonus. 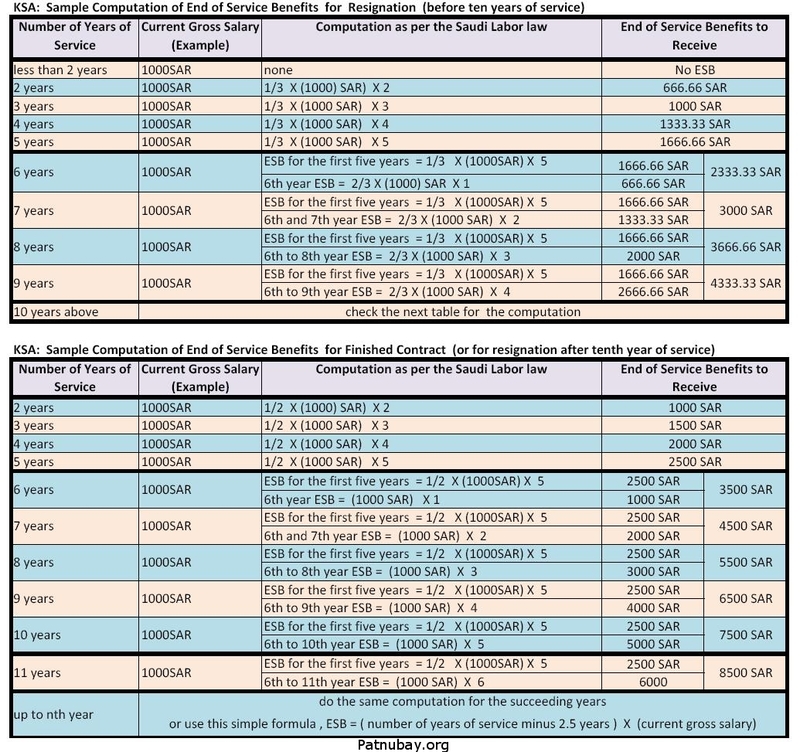 Please check the graphics (table) para lalong maunawaan kung papano mag-compute ng ESB. Ang mga sumusunod ay ang mga Provision ng Saudi Labor Law na may kaugnayan sa ESB. If the relationship is terminated because of the resignation of the workman, the workman shall in this case be entitled to one third of the award after a service period of not less than two consecutive years and not more than five years, to two thirds if his period of service is in excess of five successive years but less than ten years and to the full award if the period of service amounts to ten or more years. To the exclusion of the provisions of Article 85, the workman shall be eligible for the full severance award if the workman leaves the work due to a force majeure beyond his control. A female workman shall likewise be entitled to the full severance award if she terminates her contract within six months from the date of her marriage or three months from the date of delivery of a child. Any condition that violates the provisions of this law as well as any release or reconciliation involving the rights of the workman arising from this law during the currency of the employment contract, shall be null and void, except where such condition, release or reconciliation is more beneficial to the workman. So, malinaw na hindi maaring mababawasan ang computation ng inyong ESB kahit anong contract pa or kasunduan na may ibang computation ng ESB. Ang Saudi Labor law ang dapat masunod maliban na lamang kung ang kasunduan o kontrata na mas makakabuti para sa worker. Kailan mapo-forfeit ang ESB ng isang worker? 1. If, during or by reason of the work, the workman assaults the employer, the responsible manager or any of his supervisors. 2. If the workman fails to perform his essential obligations arising from the employment contract, or to obey legitimate orders, or if, in spite of written warnings, he deliberately fails to observe the instructions related to the safety of the work and workmen as may be posted by the employer in a conspicuous place. 3. If the workman is proved to have adopted a bad conduct or to have committed an act affecting integrity or honor. becoming aware of such occurrence. 6. If the workman is hired on probation. 7. If the workman is absent without valid reason for more than twenty days in one year or for more than ten consecutive days, provided that discharge shall be preceded by a written warning to be served by the employer to the workman if the latter is absent for ten days in the first case and for five days in the second. 8. If the workman illegally takes advantage of his position for personal gains. 9. If the workman divulged work- related industrial or commercial secrets. Sino ang may karapatan na makatanggap ng End of Service Benefits? Ang mga manggagawa na ang profession o trabaho na sakop sa mga provisions ng Saudi Labor Law. Sino ang SAKOP ng mga provisions ng Saudi Labor Law? 1-Each contract whereby a person undertakes to work for the account of the employer and under his management and supervision in consideration for a wage. 2-Workmen of the government and general organizations, including those involved with animal husbandry and agriculture. 4-Workmen in agricultural and animal husbandry establishments which employ ten workmen and more. 5-Workmen in the agricultural establishments which process their own products. 6-Workmen who operate and repair on an on going basis the mechanical machinery necessary for agriculture. 7-The apprenticeship and training contracts with workmen other than those of the employer within the limits of the provisions set forth in this law. 8-Part time workmen within the limits related to occupational safety and health and workmen injuries and the other categories designated by the Minister. Sino ang HINDI sakop ng mga provisions ng Saudi Labor Law? 1-Members of the employer’s family, namely his wife, ascendants and descendants who work in the establishment with no other employees. 2-Domestic servants and the like. 3-Sea workmen who work in vessels whose tonnage is less than 500 tons. 4-Agriculture workmen other than the categories set forth in Article 5. 5-Non Saudi workmen who are brought in to perform a specific task and for a period of not more than two months. 6-Players and coaches of sport clubs and associations. The Ministry of Labor shall, in coordination with the competent agencies, draw up and submit to the Council of Ministers the rules applicable to domestic servants and similar categories to regulate their relationship with their employers and to define the rights and duties of each party. Ito ang ang esb calculator direkta sa ministry of labor (labor education) website. Marami kasing links ngayon tungkol sa esb calculator pero karamihan pinadaan muna sa ibang mga blogs or websites.. Itong naipost natin ay direkta na sa calculator page mismo ng ministry of labor (labor education pages) website..
Ang laboreducation.gov.sa ay proyekto ng ministry of labor para madaling maintindihan at sundin ng employer at worker ang batas paggawa ng kaharian.